Crown Group has unveiled the much anticipated designs for the Piazza at its V by Crown project in Parramatta. Buttressed by the heritage-listed Parramatta Park and Parramatta town centre; the Piazza will be home to two iconic V-shaped columns, each standing a striking three storeys tall; nine dining and retail tenancies and a state-of-the art archaeological showcase. The Piazza will be less than 200 metres away from Parramatta Square the focal point of Parramatta City Council’s multi-billion dollar revitalisation of its city centre. Koichi Takada Architects and Allen Jack+Cottier Architects – the teams behind the stunning concept design of V by Crown’s Piazza – have woven natural elements of granite and wood throughout the space; creating a seamless transition from the pavement, through the Piazza and into V by Crown’s grand foyer. Contemporary materials, including perforated mesh used on columns, corners and edges, will create a fresh, youthful feel; while curved horizontal timber beams will create intimate zones and divide the Piazza’s public space. “It’s the perfect place to meet friends and business clients for coffee, lunch or dinner. The Piazza is close to everything but still tucked away from the hustle and bustle of Parramatta’s streets, in a relaxed modern setting,” Anthony Falas, Crown Group’s Project and Commercial Sales Director explains. 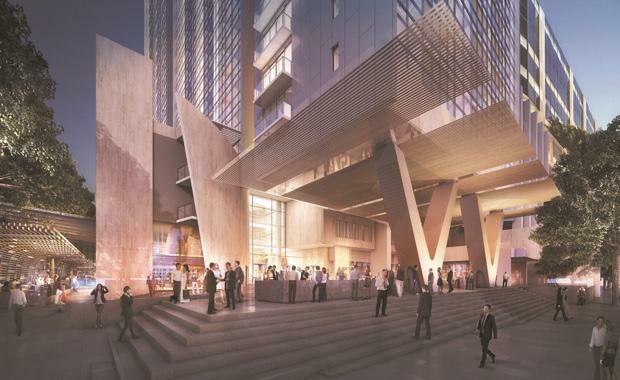 The Piazza at V by Crown will be located on the corner of Macquarie and Marsden streets in the heart of Parramatta. V by Crown includes 590 apartments and five-star resort-style facilities including landscaped gardens, a private pool deck, wine room and a stunning 25-metre lap pool. An archaeological showcase within the Piazza will display artefacts uncovered during site excavation including pieces of interest from the historic Wheatsheaf Hotel, one of Sydney’s oldest pubs. Pierre Abrahamse, Crown Group’s National Development Director says the Piazza has been designed with Parramatta’s growth in mind. “We’re seeing more and more large Australian and international corporations coming here. Parramatta is inarguably Sydney’s second CBD and growing fast,” Pierre said. “The V by Crown Piazza will be one of the most central, easily recognised meeting points in Sydney and we’re excited to see this amazing space come to life. "Now in stage two of construction V by Crown is scheduled for completion in early 2017. Crown Group is now accepting leasing enquiries for retail, restaurant and café spaces including spaces within the Piazza and spaces for lease with direct street access.